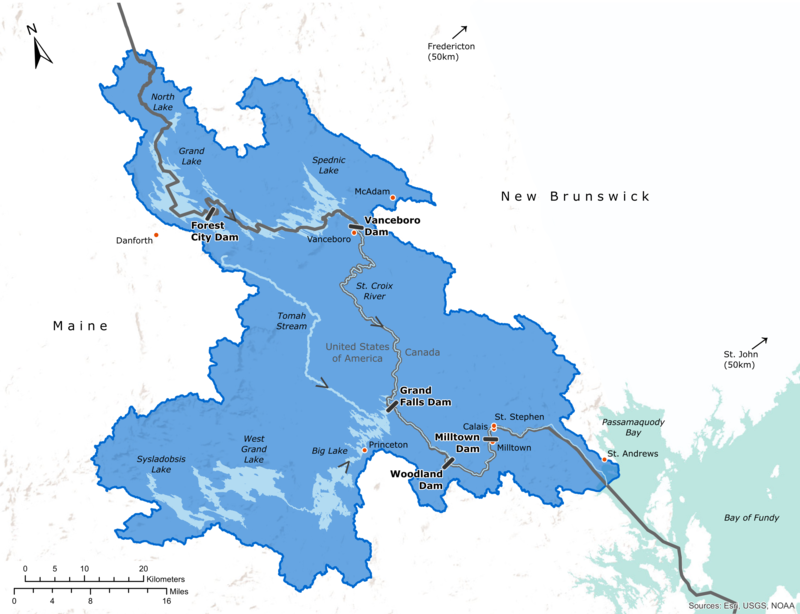 The most easterly transboundary waterway, the 185 km (115 mile) St. Croix River runs along the border of Maine and New Brunswick before emptying into the Passamaquoddy estuary linked through the Bay of Fundy to the Atlantic Ocean. The river is heavily developed for hydropower generation, has been a major source of local drinking water, and has been a site for the lumber trade since at least European settlement began. People first came to the area around 6,000 years ago, however, enjoying the annual runs of fish like Atlantic salmon, alewives, shad and American eel. The dams have made it difficult for these species to make it up the river – as did a now-rescinded law in Maine trying to block alewives from the river – but efforts in recent years to improve fish passage have seen alewives and shad begin to rebuild their populations in the waterway. The St. Croix River Watershed Board reports to the IJC on compliance with water quality objectives and ensures that four privately owned dams are operated consistent with conditions set by IJC Orders of Approval. The board helps to prevent and resolve disputes over the boundary waters of the St. Croix River, monitors the ecological health of these waters and ensures that four dams comply with the IJC’s orders of approval.